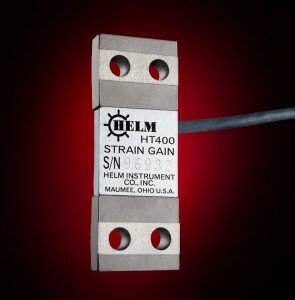 The HELM HT400 STRAIN GAIN load sensing transducer accurately detects strain levels on all types of metal stamping presses. Using either drill/tap or weld/pad mounting method, the sensor is installed directly to upright columns of straight side presses or throat area of OBI and Gap Frame presses. When interfaced with HELM monitoring systems, linear output of strain levels at each sensing location are displayed on digital meters. Strain gages in a 350 ohm full wheatstone bridge circuit are used as load sensing elements to assure long-term stability and accuracy. Manufactured under laboratory conditions, all HT400 sensors are machined within 1% and may be interchanged without recalibration of the press. Standard STRAIN GAIN sensor is supplied with 35 feet of cable (Model HT-400-35), four mounting screws, two anti-torque washers, and hex wrench. Special cable lengths and complete installation kits for use with HELM load monitoring systems are also available. Consult HELM for details. For drilled-hole mounting, DF-400 drill fixture is required. Position fixture and drill center hole. Tap hole and bolt fixture to press in proper alignment. Drill remaining four holes 3/4 inch deep. Remove fixture and tap holes. Mount STRAIN-GAIN with supplied hardware. 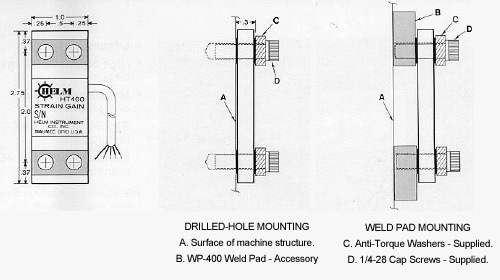 For Weld-Pad mounting, WF-400 weld fixture and one set of WP-400 weld pads are required. Clean mounting surface to accept welding. Mount weld pads to wield fixture. With gloved hand hold welding fixture/weld pads to press.